Don't get me wrong. 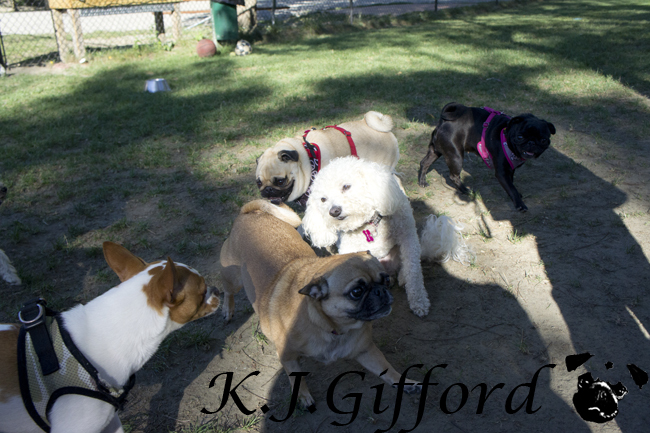 I indeed loved the dog park yesterday -- the interplay of dogs, the interplay of humans. I loved how all these various breeds of interesting canines brought us all to one place, even if occasionally some petty human dramas continued to be played out there. It was both similar to and different from the world outside. Similar in that the human likes and dislikes, social hierarchy and drama continued to be played out, different in that a community was forged in a way that we often miss today. We couldn't just pass each other by with a nod or a wave or nary a glance, we were all "stuck" there, at least until our dogs did their business and ran awhile. So, we had to chat and talk and even bond a little. Even the Real Dogowners of the Upper Valley had to converse a bit with the "underdogs," probably more than they would have on the streets. I heard about church suppers, one woman's two children and how one was an angel, the other a slob. I can tell you what their dream dogs would be. I learned about another little girl's Grammie's death and how she appeared to her in a dream the night before. I learned a lot about each dog and its behavior. We shared about previous dog's deaths and our grief. This was all within the space of less than an hour. We seldom talk to people we don't know that long nowadays. Here, our dogs make us sit and stay a spell -- our canine friends lead us to revel in our shared humanity, the good and the bad, and to get to know each other.